1. VLA students were able to witness and experience first-hand the first European settlement in the Americas in the Colonial Zone of Santo Domingo, specifically the Governor’s Mansion, once occupied by Diego Colon, son of Cristobol Colon (Christopher Columbus), analyzing the impact and legacy the era in world history has on the people and culture of the Dominican Republic. 2. Toured the Conocado Chocolate Factory, a 10,000 member cacao cooperative where individuals pool their production and invest in shared resources like access to clean water, schools, and healthcare. Unlike many farmers who sell through one or more middlemen, this cooperative utilizes their collective resources to export cacao directly, creating economic sustainability for their community. VLA students were able to see first hand how globalization and personal buying decisions impacts international communities. 3. Rare Guided Tour of the Pomier Caves. VLA students were able to participate in a rare guided tour of the world-famous Pomier Caves Anthropological Reserve, the largest collection of 2,000 year-old rock art in the Caribbean, primarily done by the now-extinct Taino tribe, the former indigenous peoples of the Dominican Republic. Students were able to learn from a local historian the philosophy and culture of the Taino peoples and the important life lessons they left behind before their decimation by the Spanish Conquistadors. Afterwards, VLA students were able to interact with local youth in the area of the reserve, playing a quick game of Futball (Soccer). 4. Partnered with the Peace Corps and the Women’s Association for the Development of Jimenoa Waterfall to gain a better understanding of gender inequality in the Dominican Republic and engage in local efforts to create economic stability for women and children. VLA students were encouraged to write letters to Dominican government officials in support of resources to develop a job training facility and access to micro-loans for the women of Jimenoa Waterfall. 5. Visited the Centro Leon Cultural Center to learn about the complex Dominican identity, racial history and contemporary culture of the Dominican Republic (DR). VLA students were hosted by internationally acclaimed musician Ricardo Toribio who immersed VLA students in Dominican culture through music and the visual arts and expanded their understanding of the African presence in DR through dialogue and poetry. 6. VLA students spent the day in the Rio Grande Abajo Community with the local environmental youth group, Brigada Verde. 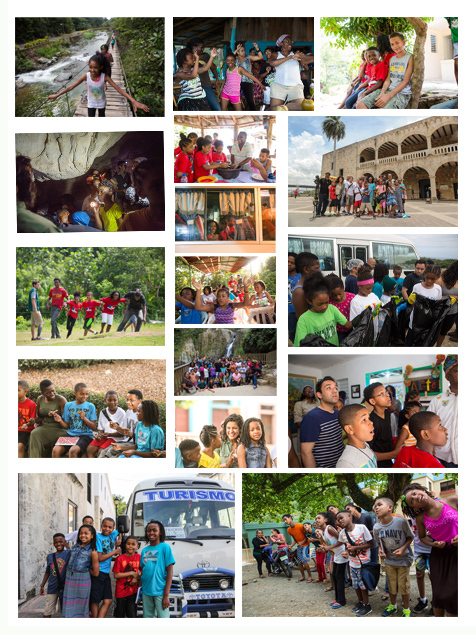 In addition to developing friendships and spending time in homes of Dominican families, VLA students gained a better understanding of how young people were working to protect their environment and keep their families safe. In addition, VLA students were able to spend a “Day-In The Life” of youth in the community, harvesting, processing and packaging locally grown cacao into a popular regional morning cacao-based beverage. 7. Utilizing their developing Spanish, VLA students partnered with youth from the DREAM Project to engage in a community wide scavenger hunt. Students explored the local school, barbershop, recreational center, and market to become more knowledgeable about the daily life of local youth. Prior to the scavenger hunt, VLA students met with teachers and administrators of the DREAM Project ask questions about poverty and its impact on the Dominican education system. 8. VLA students spent the day working alongside nation-less immigrants of Haitian descent in the Sosua Dump. Collecting and sorting trash, VLA students experienced, first hand, the living and working conditions created by harsh immigration laws and extreme poverty.